I have posted Feeding schedule for 6 month baby in my previous post. Now i am sharing what i fed maha on her 7th month. This month we took her anna prasanna, so i have included rice in her diet. Since it is very filling, i have reduced the amount of other solid foods like ragi and raw banana to her. 9.00 to 9.30 AM - Maha usually wakes up during this time. We just play together for few minutes, kissing hugging, snuggling goes on..Then i take her out from bedroom.. I start her day with ceralac. She plays for sometime and i pat her put her back to nap. She sleeps for a good 2 hours or so..
11.30 to 12.00 AM - She wakes up and i make her next food all ready. This time is usually her lunch. I make rice khichdi for her. I add lots of vegetables and spinach in them. You can check out the way i make it right here.I feed her lots of drinking water along with her food. After getting fed she plays a lot and gets tired. So i pat her and put her to a quick nap. 4.00 PM - 4.30 PM - Since i have fed maha with rice, i dont go on feeding her heavily. It will be some kind of veg or fruit purees. I feed either Potato, Carrots, Beets puree or a combination of these veggies. I feed her either apple puree, pear puree or apple pear cinnamon puree, banana puree..I feed her lots of drinking water along with her food. 6.00 to 7.00 PM - This would be her dinner. It will be mostly idlies or steamed dosas. I add some warm water in it and mash it will a spoon and feed her. Don't forget to feed water to you baby. If she keep on crying or feels hungry at night. I feed her with formula milk. Inbetween these schedule in keep on feeding her mother feeding. I dont give much of formula milk, mother feeding is what i prefer. And after 8.00 PM i dont feed any solid foods, i feed her mother feeding only. I feed her lots of water. 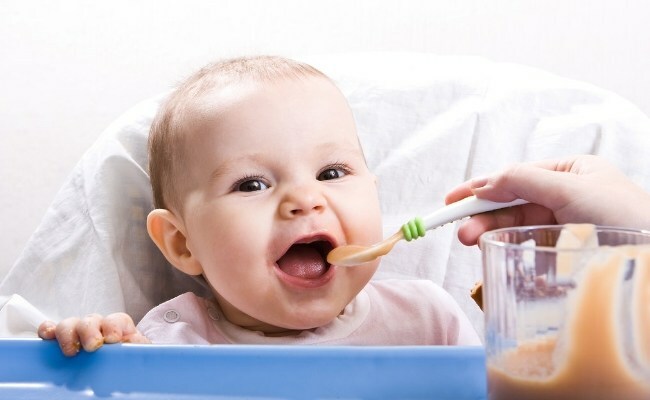 hey.. my daughter is months too.. n she just takes 4 to 5 teaspoons of anything i give her in solids.. is that enough for her? Yes that is good, just dont over feed her. Feed her little amount in certain intervals, this will make them filling. DOnt try to feed all the food in the same time. It will make them vomit. Is this feeding schedule is for 7 month completed baby or 7 month starting baby?